I love this dish! I was first introduced to it in a potluck before I became a vegetarian. I didn't know the name of the dish but I knew I liked it. Then, after I became a vegetarian, I saw this dish at Korean markets, packaged in clear plastic containers. In Korean markets, there is hardly any label or sign in English on the containers. Again, I still didn't know the name of this dish. I was afraid to buy it since I was not sure whether beef, shrimp, or chicken broth was used in the cooking process. This year I encountered a vegan Korean blog(the one and only, I think): The Vegan 8 Korean. 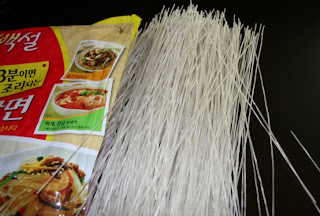 I love this blog and recommend it to you to check it out if you like Korean dishes. Voila! I saw the recipe of the mystery dish and tried it. It was very good! 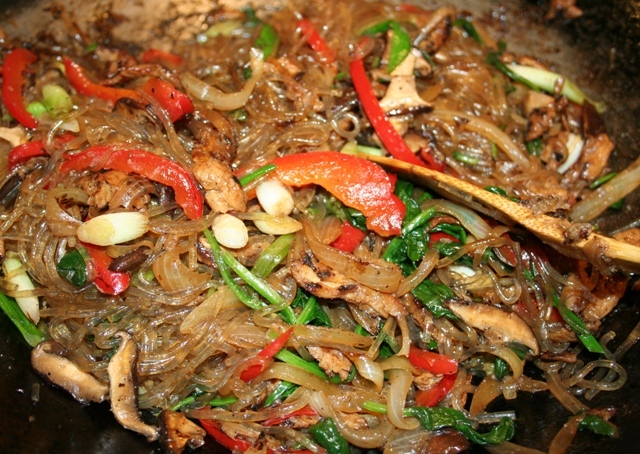 This dish is called Japchae. It is a dish that Koreans brought to parties, potlucks, and community events. 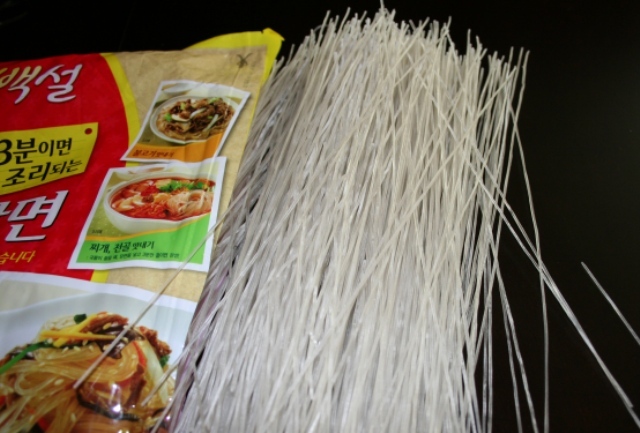 The glass noodle is made of sweet potato flour and this kind of noodle is called Dangmyun (as pictured). Now, I really appreciate that Sunnie from The Vegan 8 Korean took a picture of the Dangmyun. Otherwise, I would not have known how to find it in the Korean market. 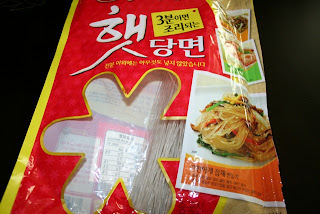 As I said, usually, there is no translation on Korean products so I am often at lost trying to find the ingredient. 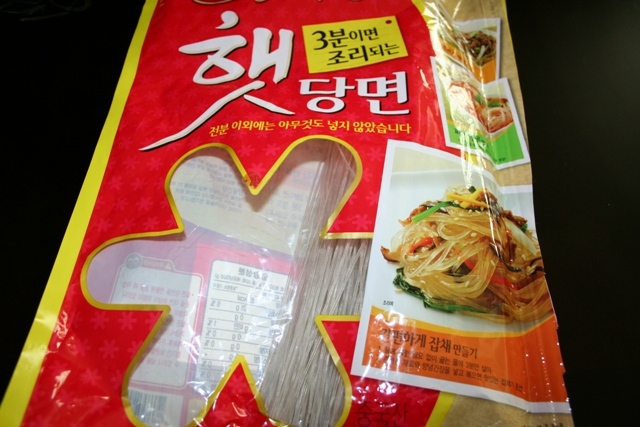 As you can see there is no English name on the package although there is a picture of the dish on the package which helped. 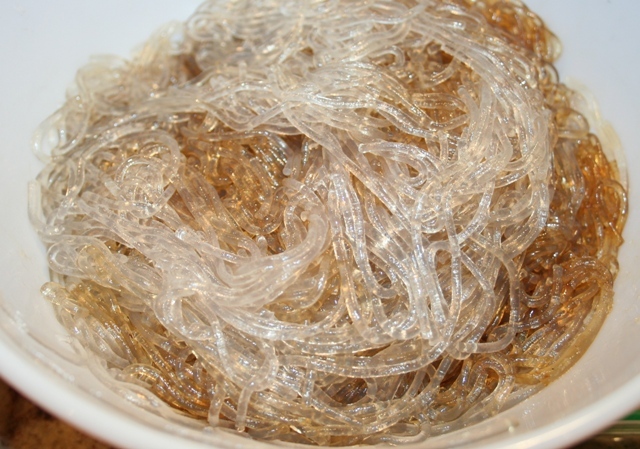 This is different than the Chinese Bean Thread noodle or cellophane noodle that is made of mung bean starch. The Dangmyun is thicker and stronger. "My mother taught me the importance of making sure to stir-fry each ingredient individually. One could easily be tempted to add all the vegetables at once and fry them together. But by frying them individually, the flavor and color of each vegetable is preserved without any cross blending of the other ingredients. As a result, the frying pan becomes more seasoned as layers of umami build on each other. The final dish is a beautiful medley of noodles, colorful vegetables, and tofu. From an aesthetic point of view jap chae is one of the most beautiful dishes in Korean cuisine." Right on! Thanks Alice for the tip. I agree that this dish is colorful and umami-ful. I also learned that by reading blogs, I can learn a lot about cooking and ethnicity of a dish. It is so much fun! 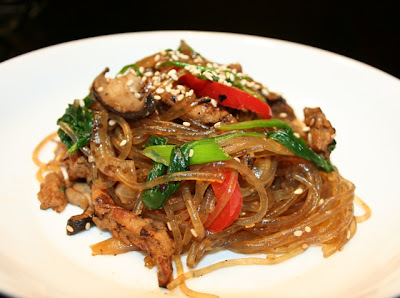 Below is my version of Japchae with Soy Curls. It is optional for using soy curls. I often make this dish without soy curls, but I think by now, vegetarians and vegans should all learn about how great Soy Curls can be. Prepare soy curls by soaking it in hot water for 10 minutes, squeezed the water out, add chiknish or non-salty veg powder. Then, add the hoisin sauce or teriyaki sauce to marinade. Set aside. Boil the dangmyun in boiling water for 10 minutes. Drain, pour cold tap water to stop the cooking process. Then, drain again. Immediately add 5 tablespoon soy sauce, black pepper, and 2 tsp. sugar into the drained glass noodles and combine thoroughly. If using dried shitake mushroom, soak the mushroom in warm water for 15-20 minutes. While waiting for soy curls to marinade and noodle to cool, slice the vegetables. Drain and slice the soaked mushrooms also. Stir frying soy curls in my old Chinese wok. Coat a wok or large frying pan with 1 tsp oil. 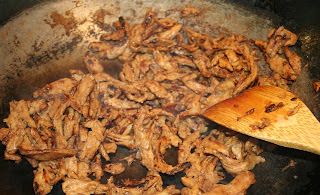 Put it on a high heat and start with the soy curls.﻿﻿﻿﻿ When soy curl is dry and brown, remove from wok and set aside. Add onions to the wok. Sprinkle with a little salt, stir fry for 4-5 minutes until translucent. Remove from wok. Set aside. 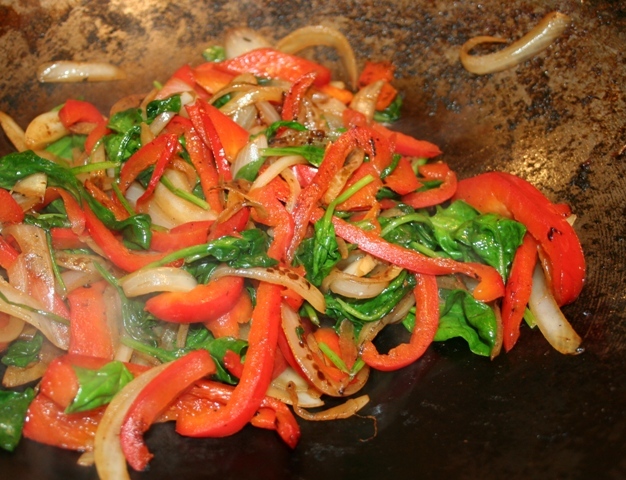 Repeat this process each separately with carrot, red bell pepper, spinach, and green onions. Everytime, sprinkle a little salt and stir fry until vegetables are cooked. Add a little water if vegetable sticks to the wok. You will notice that brown bits are forming in your wok and loosen up when you add water. That actually adds flavor to the veggies. When stir frying the sliced mushrooms, add the 1 tsp. soy sauce instead of salt.﻿﻿ Combine and set aside all cooked vegetables onto a large plate. This is what the cooked vegetable looks like when combined together. Add the rest of the oil (2 tsp.) to the hot wok. Then, add the minced garlic, stir fry for 1 minute until fragrant, keep stirring to avoid burning. Add the vegetables, soy curls, and seasoned noodles back to the wok and combine well. Stir fry for a few minutes until noodles are heated through. Turn off heat. Add sesame oil, stir, and combine well. Sprinkle with roasted sesame seeds when serving. All ingredients combined together and stir fried. This noodle dish is good at room temperature too. It is a great dish to bring to a potluck. DH brought this dish to his potluck at work and he didn't have to reheat it before serving it. He said that people at his work loved it and a few asked for the recipe. The Koreans also serve this dish as Banchan which are dishes in small plates (such as tapas) that are served with cooked/steamed rice. Most of these dishes on small plates are served in room temperature also. This will be the next dish I will bring to a potluck at work. I love Japchae too Debbie! I will make your recipe soon. It looks fantastic! This looks really good! I'm really impressed with your instructions because they're very easy to follow. I will save this now and go to the market to buy some ingredients of this dish so that I can cook this immediately. I am from South Korea and I LOVE japchae.